Short for AlgoExchange, AlgoEX is a web application which tracks the performance of many trading systems executed by BTR Trading Group. Get live intraday PNL charts and stats for trading systems via real client fills or simulated hypothetical tracked performance. 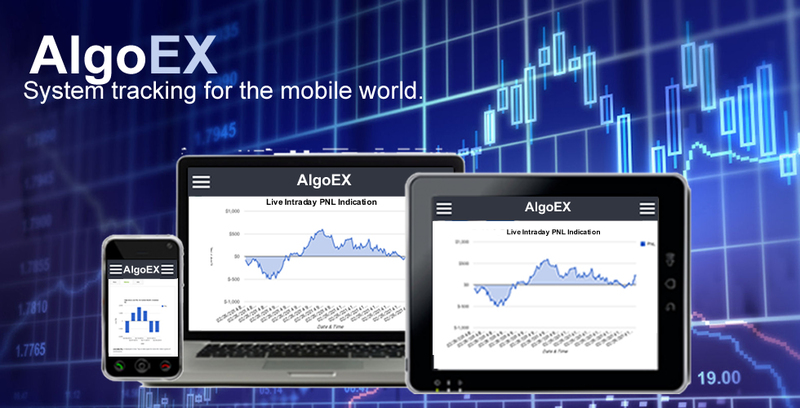 AlgoEX is designed for the mobile experience and accessable via almost any internet connected device, from your smart phone to your tablet. Use it to track systems that you trade or to look at new systems for your portfolio. Ready to check it out for yourself? 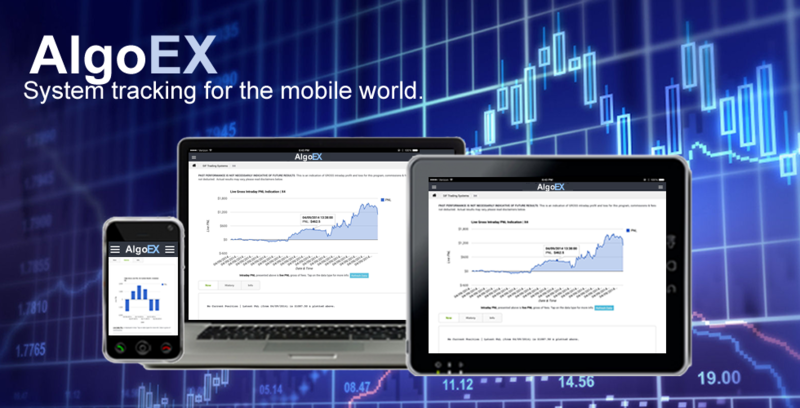 Click the button below and launch AlgoEX on your PC, tablet or smartphone. THE RISK OF LOSS IN TRADING COMMODITY FUTURES AND OPTIONS CAN BE SUBSTANTIAL AND MAY NOT BE SUITABLE FOR ALL INVESTORS. Prior to purchasing or leasing a trading system from any other system vendor, investors need to carefully consider whether such trading is suitable for them in light of their own specific financial condition. In some cases, futures accounts are subject to substantial charges for commission, management, incentive or advisory fees. It may be necessary for accounts subject to these charges to make substantial trading profits to avoid depletion or exhaustion of their assets. In addition, one should carefully study the accompanying prospectus, account forms, disclosure documents and/or risk disclosure statements required by the CFTC or NFA, which are provided directly by the system vendor and/or the broker carrying your account. Past performance is not necessarily indicative of future results. Statistics, tables, charts and other information on trading system performance on AlogoEX are derived from a combination of simulated hypothetical trading results and actual fills using trading systems software on futures trading platforms. Actual dollar and percentage gains/losses experienced by investors would depend on many factors not accounted for in these statistics, including, but not limited to, starting account balances, market behavior, developer fees, incidence of split fills and other variations in order execution, and the duration and extent of individual investor participation in the specified system. Other expenses such as exchange fees, NFA fees, transaction fees, software or system costs are not accounted for herein, and will affect investors net results in actual trading. While the information and statistics given are believed to be complete and accurate we cannot guarantee their completeness or accuracy. THIS INFORMATION IS PROVIDED FOR EDUCATIONAL AND INFORMATIONAL PURPOSES ONLY. These results are not indicative of, and have no bearing on, any individual results that may be attained by the trading system in the future. HYPOTHETICAL PERFORMANCE DISCLAIMER: HYPOTHETICAL PERFORMANCE RESULTS HAVE MANY INHERENT LIMITATIONS, SOME OF WHICH ARE DESCRIBED BELOW. NO REPRESENTATION IS BEING MADE THAT ANY ACCOUNT WILL OR IS LIKELY TO ACHIEVE PROFITS OR LOSSES SIMILAR TO THOSE SHOWN. IN FACT, THERE ARE FREQUENTLY SHARP DIFFERENCES BETWEEN HYPOTHETICAL PERFORMANCE RESULTS AND THE ACTUAL RESULTS SUBSEQUENTLY ACHIEVED BY ANY PARTICULAR TRADING PROGRAM. NO FINANCIAL ADVICE PROVIDED: BTR TRADING GROUP MAKES NO REPRESENTATIONS AS TO WHETHER AN ALGORITHMIC STRATEGY IS APPROPRIATE FOR YOU. FURTHER, BTR TRADING GROUP MAKES NO REPRESENTATIONS OR GUARANTEES AS TO THE PERFORMANCE OF ANY ALGORITHMIC TRADING SYSTEM OR STRATEGY. THROUGH YOUR OWN SELECTION, IT IS UP TO YOU TO DECIDE WHETHER A STRATEGY IN WHICH YOU PARTICIPATE IS APPROPRIATE FOR YOU. YOU ACKNOWLEDGE THAT YOU ARE CAPABLE OF INDEPENDENTLY ANALYZING SUCH CONTENT USING YOUR OWN EXPERTISE, DUE DILIGENCE AND DECISION MAKING AND THAT YOU ARE NOT RELYING ON THIS SITE AS A BASIS FOR ANY DECISIONS YOU MAY MAKE CONCERNING INVESTMENTS. YOU SHOULD NOT CONSIDER ANY CONTENT ON THIS SITE TO BE PROFESSIONAL INVESTMENT, TAX, TRADING OR OTHER FINANCIAL ADVICE. NOTHING ON THE SITE SHOULD BE CONSTRUED AS A RECOMMENDATION OF ANY SECURITY, FUTURES CONTRACT, COMMODITY, TRANSACTION, INVESTMENT STRATEGY, OR EXCHANGE OR MARKET BY BTR TRADING GROUP, ITS AFFILIATES OR ANY THIRD PARTY. ALL CONTENT ON THIS SITE IS IMPERSONAL AND NOT TAILORED TO THE INVESTMENT NEEDS OF ANY SPECIFIC PERSON. General Risk Disclosure for Futures Trading: Transactions in securities futures, commodity and index futures and options on futures carry a high degree of risk. The amount of initial margin is small relative to the value of the futures contract, meaning that transactions are heavily “leveraged”. A relatively small market movement will have a proportionately larger impact on the funds you have deposited or will have to deposit: this may work against you as well as for you. You may sustain a total loss of initial margin funds and any additional funds deposited with the clearing firm to maintain your position. If the market moves against your position or margin levels are increased, you may be called upon to pay substantial additional funds on short notice to maintain your position. If you fail to comply with a request for additional funds within the time prescribed, your position may be liquidated at a loss and you will be liable for any resulting deficit.